Whether visiting our region or just passing through, our goal is to assist you in planning a memorable birding experience in our region. 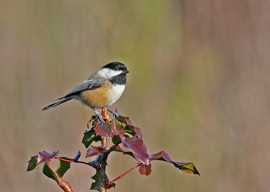 By partnering with local birding enthusiasts, we are excited to provide to you valuable information for your birding trip. Explore our website to discover what makes our region a unique and memorable place to bird. After birding the Omaha metro area for some 30 years, I find I can locate a good variety of birds most any time of the year. Spring and fall are the peak seasons for migrating passerines - warblers, vireos, flycatchers and tanagers - through the wooded Missouri River valley. From north to south, good locations are places like Boyer Chute, Neale Woods, Hummel and Dodge Park, Fontenelle Forest and Schilling WMA. The Lincoln metro area has some excellent locations for waterfowl and gull migration around the numerous lakes of Lancaster County - Branched Oak Lake, Pawnee Lake and Holmes Lake to name a few. 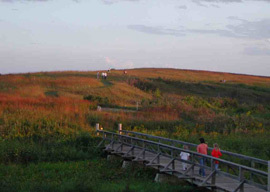 In addition, the Spring Creek Prairie offers good possibilities of seeing such prairie birds as Henslow's Sparrow, Dickcissel and Greater Prairie Chickens. 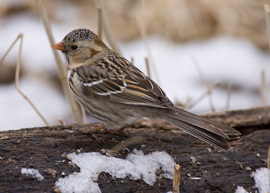 In general, the two metro areas of Omaha and Lincoln offer great diversities of bird habitat (lakes, prairies, woodland, and riparian) which in turn bring in a great diversity of bird species most any time of the year. My serious interest in birding began about 35 years ago. Since then, I have been to many of the locations in the seven county area listed on this web site, an area that contains a wide variety of different habitats supporting a very diverse array of bird life. One can literally go from forested woodland habitats like Fontenelle Forest or Wilderness Park to large prairie sites like Spring Creek Prairie, home to an entirely different group of birds, in a matter of minutes. In spring, concentrations of migrating waterfowl on our rivers and lakes are outstanding and, again, because distances between sites are small one can spend more time birding and less time and money driving. Birding this little piece of Nebraska has always been a treat. Great diversity, good bird numbers and many lovely, uncongested sites within easy driving distance of each other; all of them close to metropolitan areas with excellent accommodations, entertainment and dining. What is the fastest growing outdoor family activity in the U.S.? It might just surprise you. Then again, maybe not. Not if you're one of the more than 75 million Americans who already enjoys feeding and watching birds.